The Bedford Citizen is sponsoring a “One Book, One Bedford” community-reading program of John Lewis’s graphic-novel trilogy MARCH, co-written by Andrew Aydin and illustrated by Nate Powell. The trilogy covers Lewis’s youth in rural Alabama, his young adulthood as student activist and Freedom Rider, and his leadership in the Student Nonviolent Coordinating Committee, which brought him to national prominence as one of the “Big Six” in the Civil Rights Movement and a key figure in the 1963 March on Washington for Jobs and Freedom. As we have noted from the beginning, “The Citizen is intended to be a kind of meeting place for the community. Interaction and community participation are not just desirable—they are essential to the mission.” The One Book, One Bedford program, originated by the Bedford Free Public Library in 2004, exemplifies the kind of community engagement the Citizen seeks to create and support. We are proud to provide a platform for an acclaimed, innovative book series that underscores the importance of the First Amendment. The program will feature a workshop on the graphic-novel format; a lecture by Professor Dan Breen on the history of the Civil Rights Movement; book discussion groups open to all; a screening of the film SELMA, directed by Ava DuVernay; and programs for children and young adults as well. The month-long program will close with two keynote speakers, Rev. Irene Monroe of NECN, and former SNCC organizer Robert Parris Moses, who is featured in MARCH: BOOK THREE. All events will run in October and November 2017. Click here for a schedule of events — and watch this page and the sidebar pages for more information! All three books in the trilogy were New York Times best sellers. MARCH: BOOK ONE was a Coretta Scott King Honor Book, an ALA Notable Book, and a winner of the Robert F. Kennedy Book Award. 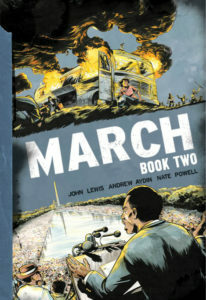 MARCH: BOOK TWO won the Will Eisner Award and was a YALSA Great Graphic Novel for Teens. MARCH: BOOK THREE won the National Book Award, the Michael L. Printz Award, the Coretta Scott King Award, the Robert F. Sibert Award, the YALSA Excellence in Nonfiction Award, and the Walter Dean Myers Award. One Book, One Bedford is made possible through the support of the Bedford Free Public Library, the Friends of the BFPL, The Bedford Cultural Council, the League of Women Voters, the Town of Bedford, and the Bedford Public Schools.